An incredibly scenic trail, hikers will enjoy panoramic views of jagged peaks and crystal blue lakes as they steadily gain elevation and at tines hike along shear cliffs. Numerous waterfalls are visible along the hike which terminates at the foot of the Grinnell Glacier and Upper Grinnell Lake. An excellent place to view bighorn sheep and mountain goats. From the Many Glacier Entrance to Glacier, (hyperlink to directions part on Glacier page) drive into the park and pass the Many Glacier Lodge. Park at the Swiftcurrent Lake picnic area. 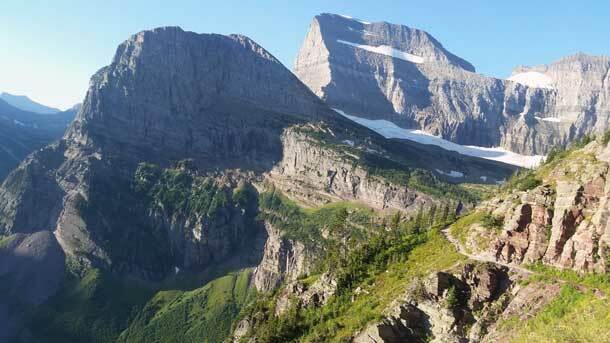 Take Trail 167 to Trail 168 around the lake and from there, take Trail 170 Grinnell Glacier Trail.